Normally if a publisher publishes a message to a topic, and no one is subscribed to that topic the message is simply discarded by the broker. However the publisher can tell the broker to keep the last message on that topic by setting the retained message flag. This can be very useful, as for example, if you have sensor publishing its status only when changed e.g. Door sensor. What happens if a new subscriber subscribes to this status? Without retained messages the subscriber would have to wait for the status to change before it received a message. However with the retained message the subscriber would see the current state of the sensor. What is important to understand is that only one message is retained per topic. The next message published on that topic replaces the last retained message for that topic. In this tutorial We will use a Python script to publish and subscribe to messages. We will then examine how retained messages work with various flag and QOS settings. The important thing to note is that we will publish the messages before the client subscribes. You should also note that I use clean sessions to avoid confusion. If you don’t use clean sessions then you might see messages that have been stored but not retained! We will also look at publishing multiple messages and how to remove or delete a retained message. Example 1 – Retain message flag not set and the new subscriber doesn’t get the message i.e no message received. Example 2-Retain message flag set and the new subscriber gets the last message as indicated by the message received message. 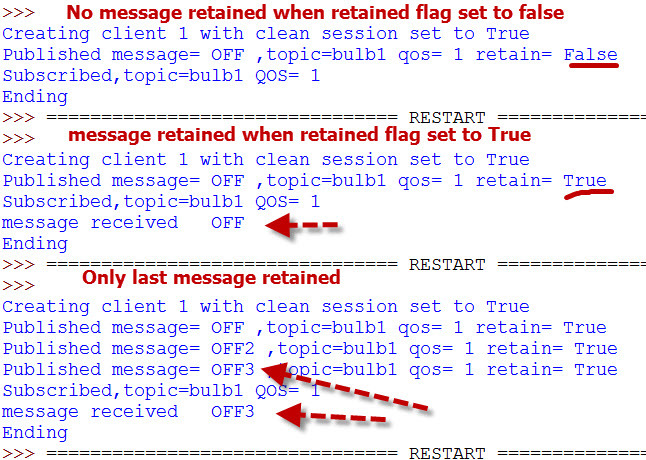 Example 3– Retain message flag set and we publish several messages OFF,OFF2,OFF3. However the new subscriber only gets the last message OFF3. 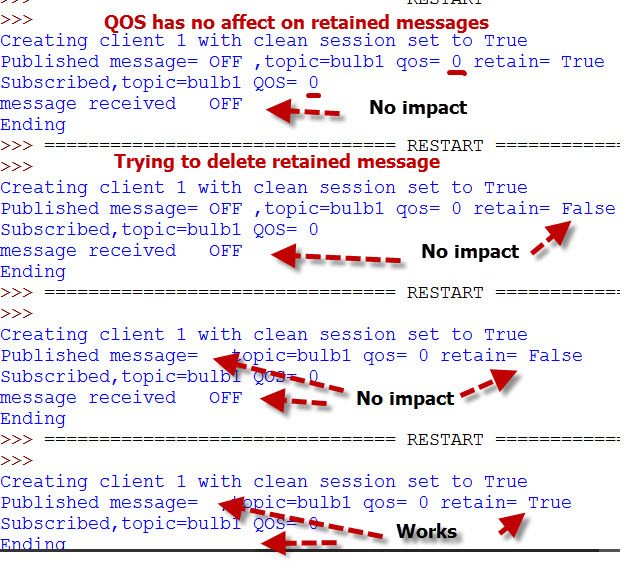 The screen shot below shows 4 connection examples to demonstrate QOS effects, and then how we delete retained messages. Example 1: We check if the QOS settings have any effect by setting the QOS to 0 . We see that the retained message is still received and the QOS of the published message has no effect.. Example 2: Now we try to delete the retained message by setting the retained message flag to False. However we notice that he message is still retained. Example 3: Now we set the message to blank but keep the retained message flag as False. Again the message is still retained. Example 4:: Lastly we set the message to blank and the retain flag to true which clears the retained message. 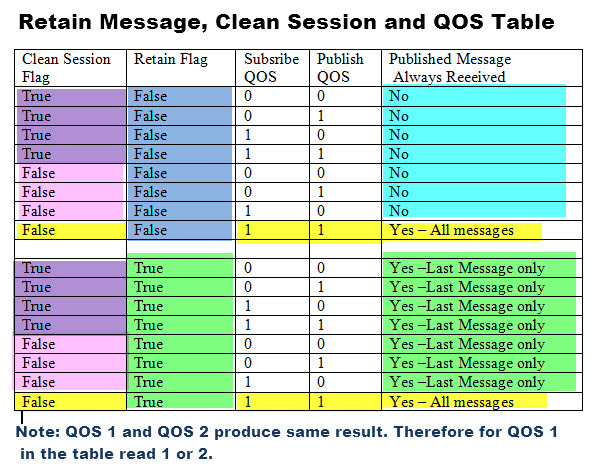 The table below is a summary showing how QOS, the clean session flag, and retained message flag affects what messages are received by a new subscriber to a topic. Note: Some aspects of how the retain flag is handled is broker implementation dependent. When you subscribe to a topic that has a retained message that message will be delivered to your client. Here is a video that I created that covers publishing messages and also shows the use of the retain flag. Grateful of any feedback. Q- How do I remove or delete a retained message? A- Publish a blank message with the retain flag set to true which clears the retained message. Q- Does the QOS of a message have any effect on retained messages? Q- How do I know If a message has been retained? A- You only know when you subscribe to the topic and examine the retained flag. Q- If I subscribe to a topic and receive the retained message does the broker/server then delete that message? A- No. It is retained and will be set to new clients when they subscribe. Q- How do I delete or clear all retained messages on Mosquitto? A- If you’re not using the persistent database then the easiest way is to stop and restart mosquitto. Otherwise you will need to subscribe to all topics to check and clear the retained messages. You can use my Python script to do this. However this is not recommended on a busy broker. Generally you will publish a message with the retained flag set when the message contains persistent data. For example a sensor could publish information about itself like firmware version number,IP address, Current state. This information is unlikely to change and so you only need to publish it once using the retain flag and any new clients can retrieve that information. See the Homie convention for example sensor topics and attributes. The retained message feature is useful feature for keeping the last state of an object, and is especially useful when the state doesn’t change frequently. Quality of service settings don’t impact retained messages. How can I retain all messages for a topic until they are read? Problem scenario: If the consumer drops, and only the last message is retained -> data loss. I would like the broker to keep all messages until they are read by the consumer. I’m so confused why this doesn’t seem to be possible?